Medicinal Properties:In Ayurvedic medicines the Bark of the tree is mainly used in preparations. 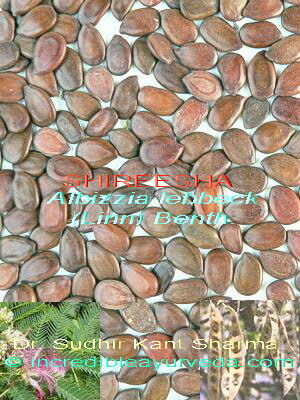 Use of Shireesha has been comprehensively recommended to remove toxins from the body. It has also been used in the treatment of respiratory problems like bronchial asthma and seasonal cough and cold. Kwath (herbal tea) made from bark of Shireesh is indicated for asthmatics as it helps to control the frequency and intensity of the dyspnoea due to asthmatic attacks. In Ayurveda its use in allergic skin conditions, allergic cough and seasonal cold is indicated to get relief.